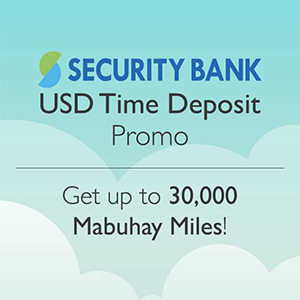 All Access accountholders who open USD Time Deposit accounts will be rewarded with Mabuhay Miles. 1. Promo is valid from March 15 to May 30, 2019. 2. Promo is open to new and existing Security Bank All Access accountholders (“Qualified Clients”). Have an existing All Access account. Qualified Clients may open an account the same day as the USD Time Deposit account opening date. Open a USD Time Deposit account/deal and deposit a fresh fund of at least US$10,000 with a 6 months tenor within the promo period. 5. Clients must have an existing Mabuhay Miles account to qualify for the reward. 6. The rewards will be credited to the Qualified Client’s Mabuhay Miles account after 15 banking days from their USD Time Deposit placement. 7. Qualified Clients can open as many USD Time Deposit deals and accumulate the corresponding miles equivalent as possible, provided that the amounts deposited are fresh funds and within the promo period. 8. The USD Time Deposit funds deposited for the promo will be put on hold for the full 180-day term from the time of deposit. 9. Should a client decide to withdraw the amount or close the USD Time Deposit account before the end of the 180-day term, Security Bank will deduct the equivalent monetary value of the Miles awarded from the USD Time Deposit proceeds, on top of the existing pre-termination charges. 10. This promo cannot be availed in conjunction with the other Time Deposit promos of Security Bank. 11. Applicable interest board rates will apply. The interest amount (net of withholding tax) will be credited separately to the corresponding USD Time Deposit account upon maturity. 12. Corporate accounts are not eligible to join the promo. All accounts opened during the promo period will be subject to existing KYC/account opening policies. Accounts closed within 90 days of the account opening will be subject to corresponding early closure penalty fees. All existing product eligibility criteria shall apply unless otherwise specified. 14. Miles will not be given/awarded to clients who have KYC/account opening documentary deficiencies. 15. Travel Awards shall be governed by the Mabuhay Miles Terms and Conditions; carriage and other related services performed by PAL are subject to the PAL’s Condition of Contract and the General Conditions of Carriage and Tariff Regulations as approved by the government authorities. 16. All questions and dispute with respect to the promo shall be resolved by the Bank, and any decision shall be binding and conclusive on the Qualified Clients.